The HIAS welcomes refugees in Philadelphia in 2015. "The faith groups are going to kick and scream and object to every aspect of this disgusting, vile, executive order, which makes America out to be something that it's not," says Mark Hetfield, the organization's president. "You know, we are a country that welcomes refugees." President Trump's temporary ban on the admission of refugees is not going over well with the churches and religious organizations that handle most refugee resettlements in the United States. "The faith groups are going to kick and scream and object to every aspect of this disgusting, vile executive order," says Mark Hetfield, president of HIAS, a Jewish refugee society. "[It] makes America out to be something that it is not. We are a country that welcomes refugees." Of the nine agencies that resettle refugees in the United States, six are faith-based groups. "Each one of us brings together a network of communities, of social service agencies, of churches, of synagogues that are working on welcoming refugees to our communities," Hetfield says. 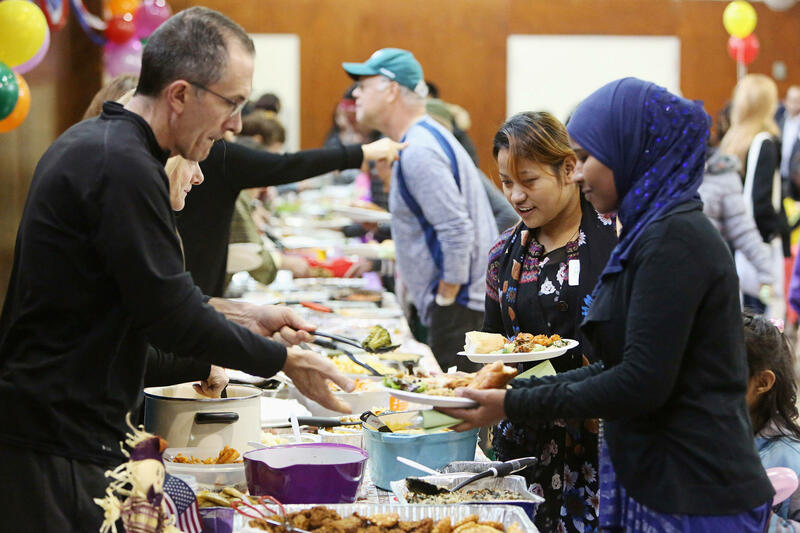 "It's so much better for refugees to be welcomed by members of a faith group than by government bureaucrats." For Jewish and Christian groups, the commitment to help refugees reflects their understanding of God's commandments. Throughout the Hebrew Bible — the Old Testament to Christians — the Israelites are reminded that they were themselves aliens once, in the land of Egypt. The book of Leviticus, for example, dictates: "The alien resides with you in your land, you shall not oppress the alien. The alien who resides with you shall be to you as the citizen among you; you shall love the alien as yourself." Such guidance continues in the New Testament: The book of Matthew quotes Jesus as telling his followers, "I was a stranger and you welcomed me, I was naked and you gave me clothing." Such passages have inspired the Lutheran Immigration and Refugee Service, which has resettled a half-million refugees and migrants since its founding in 1939. "It is deeply ingrained in our faith and our understanding of the Bible that we're called to welcome the stranger and love and serve our neighbors," says LIRS President Linda Hartke. "Not the neighbors that we choose, but the neighbors that God gives to us." The idea of prioritizing Christian refugees, as President Trump says he wants, does not come from Hartke's church or from other Christian groups. The news that Trump wants to close the door to refugees, especially from Syria, has alarmed those Lutheran congregations that were prepared to accommodate refugees. "My phone is ringing off the hook," Hartke says, "from people in local churches who want to know when they can receive a refugee family. Those are hard calls to take — to have to tell people that the president's decisions will likely mean that there won't be refugees that they can be welcoming in the months and perhaps years ahead." Hartke says the faith groups active in refugee resettlement have been "strategizing" in recent days over how to respond to the president's executive action. Their views vary. "It's important that we not see this as a partisan issue," says Sean Callahan, president of Catholic Relief Services. "Some people may see this as challenging the president, but he got elected on the basis of statements [about refugees] that he made. What we need to do is clarify what those promises actually mean. We have found that the refugees who have come to the United States have been thoroughly vetted. ... They have been placed in homes, and actually it's been an enriching experience as opposed to a threat. We need to do a better job of getting these stories out." Trump's decision to halt the refugee flow has more support among evangelicals — most of whom voted for him — but it is not exactly a blanket endorsement. The executive action on refugees came as thousands of people were in Washington for what abortion-rights opponents call the annual March for Life rally. Several speakers at an Evangelicals for Life conference, however, emphasized that their broader concern was the promotion of human dignity. "If [the refugee ban] is a temporary pause to create a screening process that helps find people who are trying to get in to do harm to this country, I understand that," says Jim Daly, president of Focus on the Family. "But I would also support a robust program to re-establish immigration, because that's what this country is built upon, and it's a great Christian tradition to bring people who are hurting." Trump's executive action did get wholehearted support from Franklin Graham, the son of famed evangelist Billy Graham. Graham, who participated in Trump's inauguration, told the Huffington Post that a suspension of the refugee program and sharp limitations on immigration from some Muslim-majority countries did not strike him as challenging God's commandments. "That's not a Bible issue," Graham said. Most of the refugees arriving in the United States are resettled here by faith-based organizations. These groups see this work as a kind of ministry. And as NPR's Tom Gjelten reports, they are not happy with President Trump's plan to suspend the refugee programs. TOM GJELTEN, BYLINE: In Judeo-Christian scripture, God's commandments on the treatment of foreigners and strangers could hardly be more clear. Throughout the Hebrew Bible, the Old Testament to Christians, the Israelites are reminded they were themselves aliens once in the land of Egypt. From the Book of Leviticus, (reading) the alien who resides with you shall be to you as the citizen among you. You should love the alien as yourself. That guidance continues in the New Testament. In the book of Matthew, Jesus tells his followers, (reading) I was a stranger and you welcomed me. Linda Hartke is president of the Lutheran Immigration and Refugee Service, which, over the years, has resettled a half million refugees and migrants here. LINDA HARTKE: It is deeply ingrained in our faith and our understanding of the Bible that we're called to welcome the stranger, to love and serve our neighbors - not the neighbors that we choose but the neighbors that God gives to us. GJELTEN: Whether Christian or not, the idea of prioritizing Christian refugees as President Trump plans to do does not come from her church or from most other Christian groups, for that matter. Hartke says since word leaked that Trump wants, at least temporarily, to close America's doors to refugees, her phone has been ringing off the hook. HARTKE: Those are hard calls to take, to have to tell people that the president's decisions will likely mean that there won't be refugees that they can be welcoming in the months and perhaps years ahead. GJELTEN: The faith groups active in refugee resettlement have been, in Hartke's words, strategizing in recent days over how to respond to the president's executive order. Sean Callahan, president of Catholic Relief Services, thinks they need to make more clear to Americans that the refugees have been carefully screened. SEAN CALLAHAN: We have found that the refugees who have come to the United States have been thoroughly vetted and that they have been placed in homes. And actually, it's been an enriching experience as opposed to a threat. GJELTEN: How much resistance to President Trump's refugee ban might we expect? Here's Mark Hetfield, president of the Hebrew Immigrant Aid Society. MARK HETFIELD: The faith groups are going to kick and scream and object to every aspect of this disgusting, vile executive order which makes America out to be something that it is not. You know, we are a country that welcomes refugees. GJELTEN: Though, as Hetfield points out, there have been interruptions in that history, as when Jews fleeing Nazi Germany were turned away. HETFIELD: Those are periods that we now look back upon with horror and shame. And what is particularly offensive to me, leading a Jewish refugee organization, is that he's signing these executive orders on International Holocaust Remembrance Day. GJELTEN: Many Evangelical Christians are in town this week for what they're calling the March for Life rally, making known their opposition to abortion. A majority of evangelicals voted for Trump in part because of his promise to appoint judges who will take a strong stand on abortion. But many say their broader concern is human dignity. While there is more sympathy among these evangelicals for Trump's decision to halt the refugee flow, it's not absolute. Jim Daly is president of the Focus on the Family. JIM DALY: If it's a temporary pause to create a screening process that helps find people that are trying to get in to do harm to this country, I understand that. But I would also support a robust program to re-establish immigration because that's what this country is built upon, and it's a great Christian tradition to bring people in who are hurting. GJELTEN: Within the evangelical world, there are dissenting voices. Franklin Graham, the son of Billy Graham, told The Huffington Post this week that the refugee question, in his view, is not a Bible issue. Tom Gjelten, NPR News, Washington. (SOUNDBITE OF SPOON SONG, "INSIDE OUT") Transcript provided by NPR, Copyright NPR.